9.5" x 8.6" stitched on 14 count. 7.4" x 6.7" stitched on 18 count. 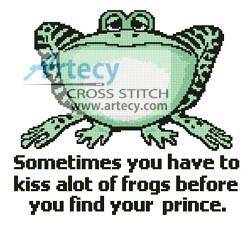 Frog Prince cross stitch pattern... This counted cross stitch pattern of a Frog with the saying Sometimes you have to kiss alot of frogs before you find your prince was created from an image copyright of www.liquidlibrary.com. Only full cross stitches are used in this pattern.